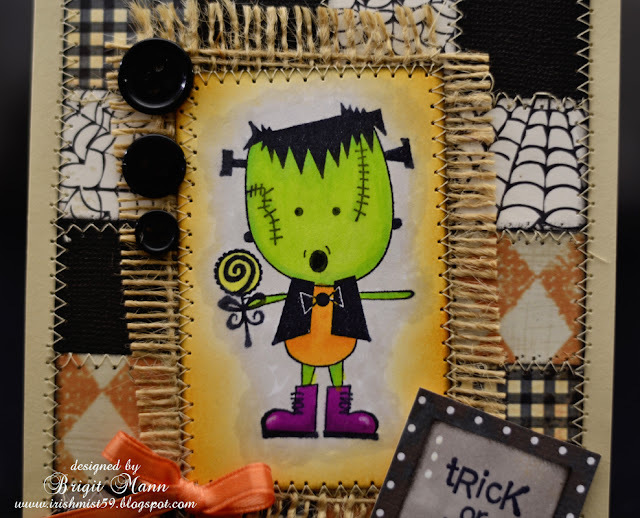 Brigit's Scraps "Where Scraps Become Treasures": Frankenstein meets Sewing Machine! Well here is my second project using my sewing machine which I'm having so much fun with. It's far from perfect but I think the imperfections really add to it, at least that's what I telling myself, LOL! I made this for the Unity's Ippity Stitches Challenge, if you have some Unity/Ippity Stamps join in the fun, http://www.unityopportunity-challenge.blogspot.com/2012/09/ippity-stitches-challenge.html. Both Frankenstein and Trick or Treat are from the Too Cute To Spook set, I think he is just adorable. The patchwork paper I made using 1" scrap pieces and stitching them together, I first glued them down onto copy paper. I stitched Frankenstein and the burlap to the patchwork and then the patchwork to the card, that was a lot of stitching, but I love how it came out!! Here is a closer look, my thread broke and I didn't realize it so I have the double holes, the casualty of sewing! This is adorable!! Your stitching is FABulous!! Thanks for playing along with the Ippity challenge!